Should you clip your horse for the winter? Well, it depends. 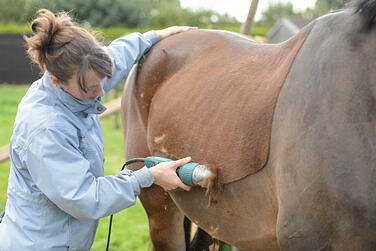 Clipping will allow your horse to dry more quickly after exercise and allow a much easier grooming process. You will also find that your horse maintains a better and healthier looking coat. If you need your horse to cool off quickly after work AND if your horse will have appropriate blanketing and adequate shelter, then the answer is yes. But remember, once you clip your horse, your horse will probably always need to be blanketed – and not always with the same blanket. In the dark of a winter night, you may need a heavyweight or even two blankets to keep your horse warm. But on a sunny day with little wind, you may still need to blanket your clipped horse to keep your horse warm enough. If your horse will keep at least a majority of his winter coat AND if your horse has adequate shelter to get out of the wet and the wind, you may not need to blanket at all. We forget that horses can actually stand colder temperatures than we can. They know all the tricks – they puff up their coat to provide more insulation, they turn their hind ends toward the wind to block the wind, they can walk around to generate body heat AND the process of eating their hay can also produce body heat. Belly and Neck Clip: a good clip suitable for horses that are used for light work or that live out during the winter months. The head, top of the neck, body and legs are left unclipped so you will still be able to turn your horse out. Low Trace Clip: a good clip recommended for horses in light work. It will help him dry more quickly, but enough coat is left on so that you can turn your horse out. However, heavier blankets may be necessary in cold or inclement weather. The legs are left unclipped for extra warmth. High Trace Clip: good for horses in light to medium work. Similar to the low trace, but the coat is clipped further up the horse. Legs are left unclipped for warmth and extra protection. Since more coat is now being removed, more and/or heavier blankets will need to be used. NOTE: You can clip your horse’s head or simply run the line up the neck and under the head. Blanket Clip: good for horses in regular work as you can exercise your horse without sweating and he will dry more quickly. The coat is removed completely from the head, neck and flanks, leaving only the legs and an area over the back that looks like a small rug. The legs are also left on for warmth and extra protection. Hunter Clip: suited for horses in hard, regular exercise such as hunting or winter showing. All the coat is clipped except for the legs, the saddle patch and an inverted V above the tail. The saddle area should match the outline of your saddle, NOT the saddle pad. The legs are also left unclipped for warmth and extra protection. When exercising outside and it’s very cold and/or windy, consider some sort of turnout blanket to keep your horse warm enough. Full Clip: usually only given to high level competition horses that work very hard. The whole coat is clipped except for an inverted V above the tail. The horse should be blanketed at all times and when very cold, bandages may be necessary to maintain your horse’s warmth. For more information on these different types of clips, there are numerous books and online resources available. Once you have decided on the style of clip you are going to give your horse, it is advisable to outline the area. Chalk or masking tape will give you a guideline to follow. Clipping is not a process you should hurry as the results will be obvious. In fact, it’s perfectly fine to pay someone at your barn to clip your horse, at least the first time. A roomy, well-lit grooming or washing stall is also a necessity so you can see what you are clipping and have all your supplies readily available. 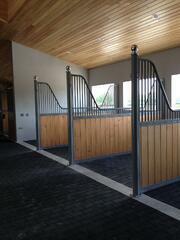 Check out Classic Equine Equipment’s website for options.